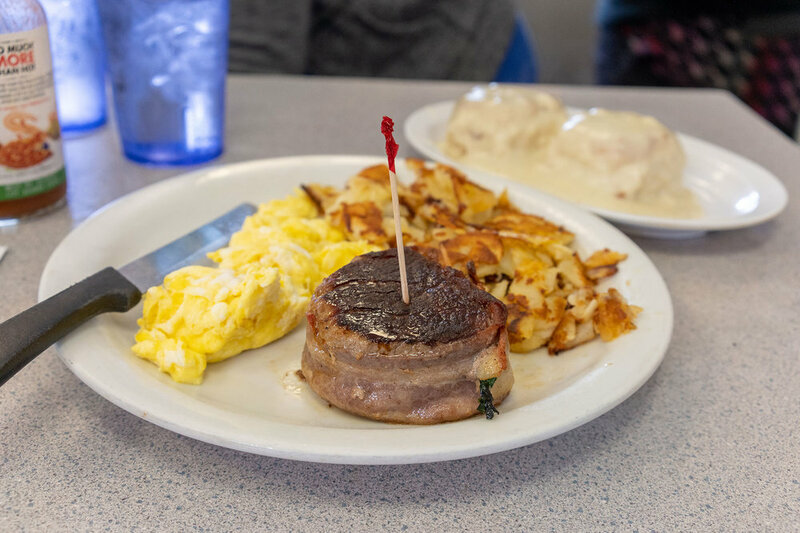 While it’s pretty easy to find a diner in Los Angeles, finding the special ones is a bit of a challenge. Pacific Diner is one of those. There are no frills. The customers are regulars. The servers know your name. You can watch the cooks in the kitchen as you sit at a laminate counter and choose something new from the specials whiteboard. It’s like Cheers but with less beer and Frasier — a small town in one of the biggest metropolitan areas in the world. The menu speaks for itself. And there’s the brown mug. It’s the international symbol for diner. So we got ambiance. What about the food? Well another part of what makes Pacific Diner special is that the food is outstanding. Chicken fried steak? A classic. This one has just the right amount of breading. 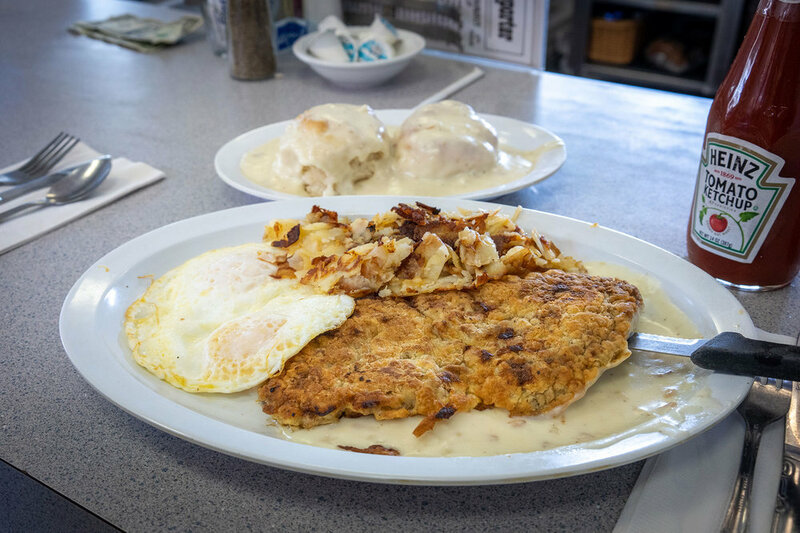 The plate has the perfect proportions of egg and potato and gravy, and it all mixes together into a gooey, salty, sloppy feast. The scramble is the same story with great proportions and the right ingredients. There’s not too much of any one thing. Also, this scramble makes me very interesting in trying their corned beef straight up. This was one of the specials when I went. The meat is tender, juicy, amazing. And it has bacon. BACON. It’s even cooked to order which is something of a rarity in most other casual restaurants. Oh, and the potatoes are always great here. I’ve had at least four different meals with a side of the potatoes, and they arrive crisp and firm and salted. I sometimes don’t even add ketchup to them — a requirement for many potato sides. Holy eff. The Benedict. LOOK AT ITS CREAMY LOVE HUMPS. Ham and egg and hollandaise. It’s rich and runny. Sopping up all that saucy goodness is a satisfying ritual. I think this dish is a hidden gem, and it deserves to be on lists of best Benedicts. 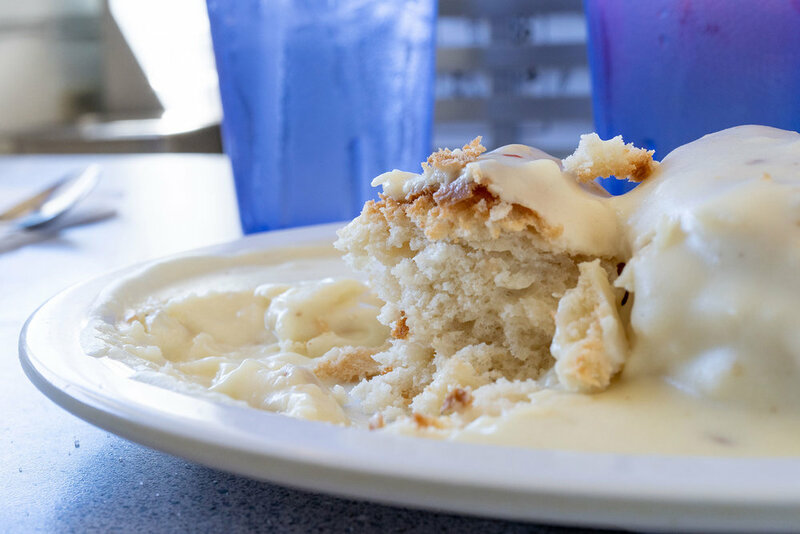 Likewise for the biscuits and gravy. The biscuits are soft and fluffy and do a great job of soaking in that hearty gravy. They aren’t hard or dry or bland like so many other biscuits. Also, the gravy does not taste like it comes out of a can. It’s creamy and floury. I mean, damn. I watched a kid across the counter absolutely ruin a full order of these things. It was quite a testament to how good they are. So yeah, I love diners, and I especially love Pacific Diner. It’s a respite from the anonymity and repetition of city life. It’s not pretentious, and it doesn’t give a crap about your avocado toast. 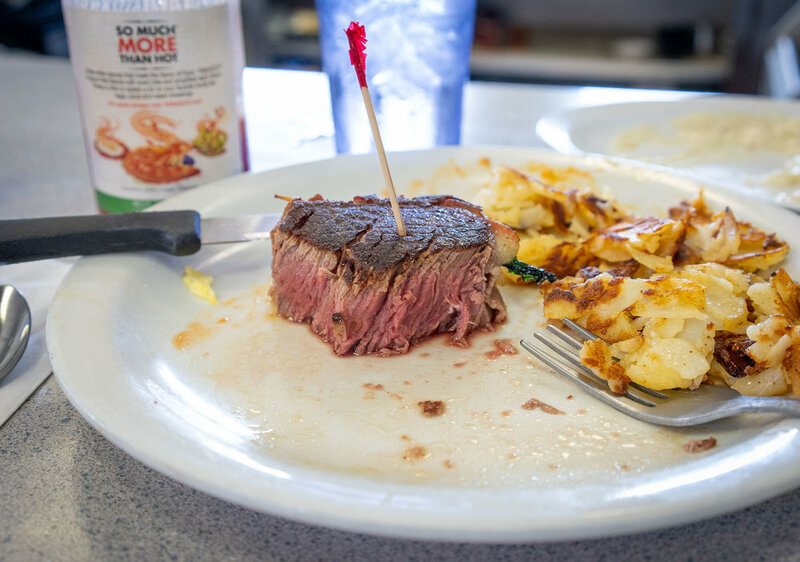 It’s classic diner food, and it’s cooked damn well. So sit down, shut up, and eat your peaches.